Trained as an architect, Trace Hurns spent most of his career doing graphic design and branding throughout the greater Chicago area. He was known for his often misguided optimism and for his love of baseball and food. Originally from Texas, he moved to Chicago after getting married to an antiques dealer. 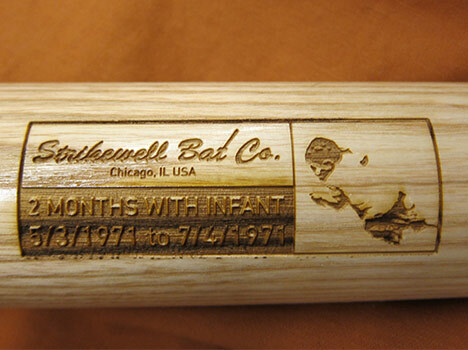 He started freelancing at age 24 and almost immediately got a job with the Strikewell Bat Company. At first he was doing logos, but eventually came up with an idea for a new type of super premium baseball bat. He called them "First Love Bats." 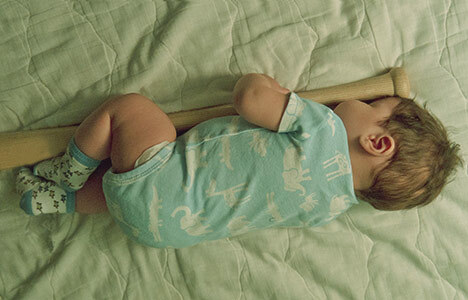 The idea was to have infants hug the bats long before they ever hugged their mothers. They would bond with the bat over their first two months. The bats would be filled with luck and positive energy and then sold for over five thousand dollars each. Many of the best hitters in the 1970's used these bats claiming that they felt a sort of pure joy when they used them. The bats put Hurns on the map, but also burdened both himself and the Strikewell Bat Company with a heap of lawsuits. Strikewell didn't make it and Hurns had to enroll in empathy counseling every Sunday for three years. Several years later, in 1980, Hurns got a job with a local pizza restaurant. The place was failing and they couldn't afford much. Working with what they had, Trace developed the Brotherhood pie. Each one of these pies would only get one pepperoni, forcing the people that ordered the pie to make a decision over who gets the special piece. 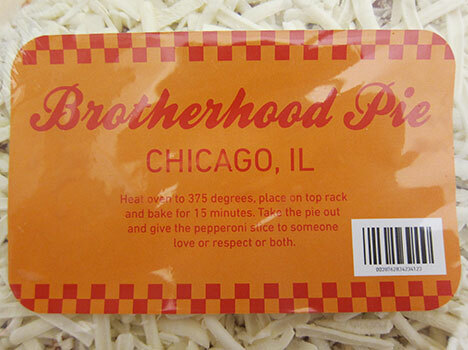 The restaurant was able to charge the same price for brotherhood pies as it did for full pepperoni pizzas. It was a success for them, but an emotional failure for Hurns. 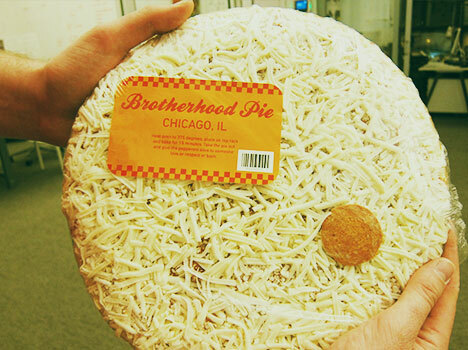 He named them Brotherhood pies because he thought that people would be generous and the decision would bring people together. In reality, they became known as "conflict pizzas" and divided more families, ended more relationships, and destroyed more friendships than any other pizza in history. This was good for business in a perverse way but it took a huge toll on Trace's emotional health. He was never the same. The pizzas are now sold frozen. To make matters worse, he was facing more lawsuits from the work he did for Fras-Oil. 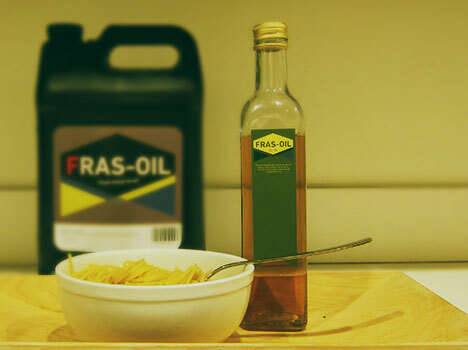 He worked on the graphic design for their motor oil jug, coining the phrase "Fras-Oil, clean enough to eat". This didn't sit well with almost anyone other than, amazingly, the people at Fras-Oil. Hurns even took it a step further by convincing them that they should also produce olive oil with the Fras-Oil brand name right on the bottle. They followed his advice and ran print ads in major magazines across the Midwest. It was very hard for Hurns to find work after this. Looking inward, Hurns started trying other things to take his mind off Fras-Oil and the pizza fiasco. He had always had a knack for getting people to pose well when he was taking pictures. He had a special way of talking—even if he was just saying "cheese." The booklet Soft-Hollering and Loud Whispers was published by one of Trace's close friends and was distributed at churches and city parks in the summer of 1986 all over Chicago. 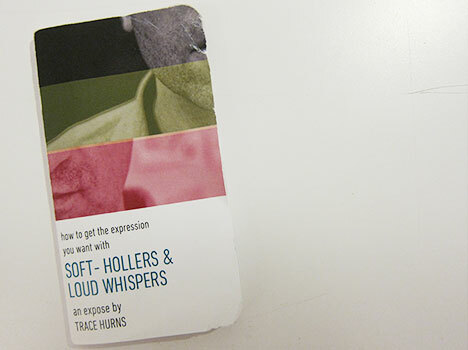 People liked talking to Trace and the booklet was well-received. One night just before falling asleep, Hurns noticed something on the doily by his bed. When he focused his eyes he couldn't see it anymore but he was convinced something was there. From 1987 to 1990 he explored this phenomenon. He drove across the country talking to people who made doilies and came to a startling discovery: there actually were hidden messages in some doilies. He developed a device that could read the messages. 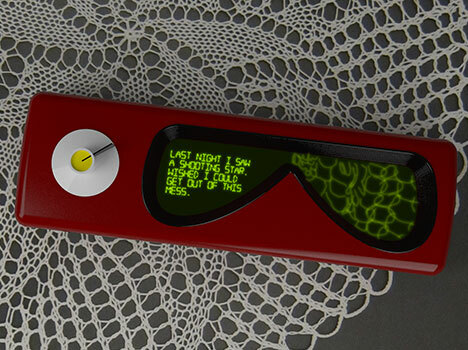 You had to scan the entire doily and then twist the tuning knob in the right direction. Many of the messages encoded were very sad. He sold the decoders at craft shows and on public access television with moderate financial success. Where is he now? Trace Hurns can still be found handing out booklets in Chicago's parks and sometimes sells decoders at the Merchandise Mart. He has no website but posts regularly on missed connection blogs. He denies that he was ever involved with Fras-Oil or the Strikewell Bat Company. 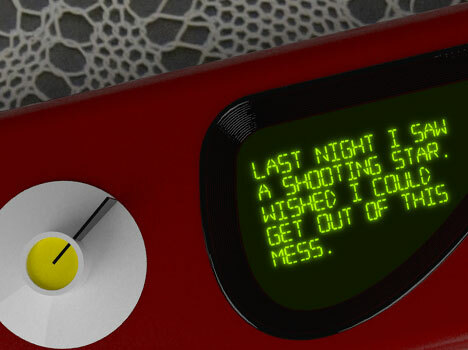 Design Fancy is a series of short stories about fictional designers who make fictional things. The stories (and the objects) are by Matt Brown. Special Thanks for Dan Deruntz for some of the photos and more. Matt Brown is a designer from the Chemical City (Midland, MI) and works at IDEO in Boston. He studied Industrial Design at Kendall College of Art and Design in Grand Rapids, MI and got his Masters in Interaction Design from the Umeå Institute of Design in Umeå, Sweden. He likes railroad tracks, talking about new ideas, and funny/awkward moments. He can't play the piano but collects synths anyway and has released a couple of records with his band Fracula. His work deals a lot with fiction, humor, and people. A good example of this would be his piece on Dogpiling and Candles. You can see Matt's work on his website, and read more on his blog. See Trace, he was a large man. Much too large for me to feel comfortable in his lap. But it was there that I found myself every year. I am his nephew Arlo and every year he would show up at our house around the holidays. I remember Uncle Tracey would sit me on his lap (after he had a few drinks) and ask me if I was "good enough for the year". I would bounce up and down on his knee, scared and excited, screaming "Yes Uncle Tracey! Yes!!". But my heart was saying "No sir. No sir at all!" I was raised to be prudent and Tracey always reminded me that sometimes you have to let your heart free. Take the child. Bounce him. Allow him to be free. Thank you Tracey. Thank you. So, my dad runs a pizza shop so i had to run the brotherhood pie story by him. He was laughing and he told me this story about this 'soft fella' who he knew back in Castell, Texas. They went to high school together, and both worked the deli in a grocery store. He says nobody liked that soft guy, being that he talked too damn much and dressed funny. They had premade meals and the workers were allowed to finish any leftover slices of cheese pizza after the lunch rush. One day the guys wanted to mess with him, so this one guy walks over with a single pepperoni slice and puts it on his pizza and then pats him on the shoulder. He says the soft guy seemed to get all touched by it. Didn't sound like they really even meant anything by it though, since my dad muttered 'b****' right after that. He said everyone at the grocer called him the peperone after that. Then he goes feeling bad for him, remembering that he was raised by his grandparents. Not sure where the parents were in all of this, but his grandmother died in high school. Dad says he was real real quiet, but 'if you accidentally looked that boy in the eyes there was gonna be no shuttin' him up.' I asked him about doilys... and this is where it gets good. He was always carrying this one in his pack. Got made fun of for it too. How much you wanna bet that was from his grandma and this guy has been trying to get in contact all the while. He probably just made up the dream story so as to not sound completely neurotic. I just feel like Trace Hurn's work was about unrequited love and deep, thoughtful design. His creations were built on deep, emotional connections who's ultimate goal was to spread love. Then ironically, tragically, the mass market could not understand what it means to appreciate love transferred through objects. I slept with Trace Hurns in 1986. I was in Chicago for the night on business, and the hotel bar was too depressing to contemplate. Instead I started walking along Michigan Ave by the park, and I noticed a man walking a few steps in front of me. 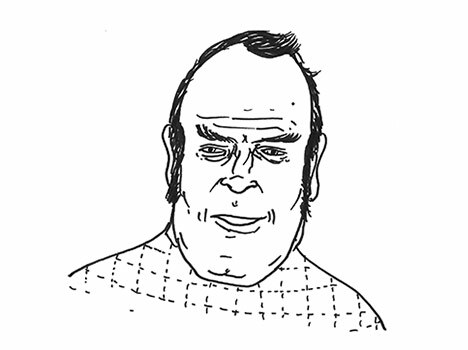 He had really long sideburns peeking out of his cable knit bears hat. We were keeping the same pace, and were just in that awkward moment when one of us would have to slow down or speed up to free up an acceptable distance between us, when there was an altercation on the street. A group of late teenage boys tumbled out of the park and started pushing each other back and forth in front of us. Their shouts grew louder, and their pushes more aggressive, until one of them turned to me and opened his mouth to speak. Before he could spit out the words, the man that had been walking apace with me slowed down, put his arm around me, and walked us quickly ahead until we could escape to a side street. This man was Trace Hurns. He asked my name, and for some reason I just made one up. We giggled in a post-adrenaline way, and kept walking around the silent Tuesday night streets as we looked at the moon and told each other stories about our lives. Well, his life and my fake one. I eventually got tired of making up stories, so I let him take me home to his apartment. He made one of those pizzas, and gave me the slice with the pepperoni, even though I just peeled it off. Things progressed as they usually do, until about 4am, when I was trying to come up with a good way to leave. Trace was snoring already, with one arm draped around my side, and I started playing with the doily on his nightstand, pushing my thumbs into the holes to make them bigger while I wondered how I ended up here, again. I eventually extracted myself from his arm without waking him, and left a note tacked to the fridge. I think I wrote the second part of that message in the doily. Things are better now. Mot Bron saved my life with a pepperoni filled slice of brotherhood pie. Oh wow, that is crazy, I haven't heard about Trace Hurns since I was a kid. My grandmother grew up in an area in southern Latvia that is well known by doily connoisseurs for their doilies and she began training to make them as a young girl. When she reached her early twenties she was brought into a small group of women, who's job it was to use their doily making skills to send encrypted messages for the Allied troops in World War I and World War II. After the war, various government agencies continued to employ their services until the mid 80's when people like Hurns started to catch on. From that point on, the practice was only done as a novelty or form of self expression. She also mentioned that she was also consulted by one of the screenwriters of the movie Wanted a few years ago and that the her interview began to inform the "Loom of Fate" in that movie. Thanks for sharing, good memories!